The largest window in our entire camper is an emergency exit, and it's right over the head of our bed. Annoyingly, we can't open it. Unless we want to be besieged by mosquitoes, that is—it doesn't have a screen. I suppose the screenlessness is so that, in case of an emergency, we could just flip the latches open and dive through, unfettered. With our camper door about ten feet away from the window, I'm not worried about blocking our escape route. What I am concerned about is the fact that it's been in the mid-90s all week, and we've had naught but a wee USB-powered fan to keep us cool. The closed pane of glass has been taunting me every night! After another long day of manual labor, I finally decided to do something about our window problem. With a little cajoling, I convinced Tyler to come with me to the hardware store. There, we poked around trying to decide how we wanted to construct our bug barrier. 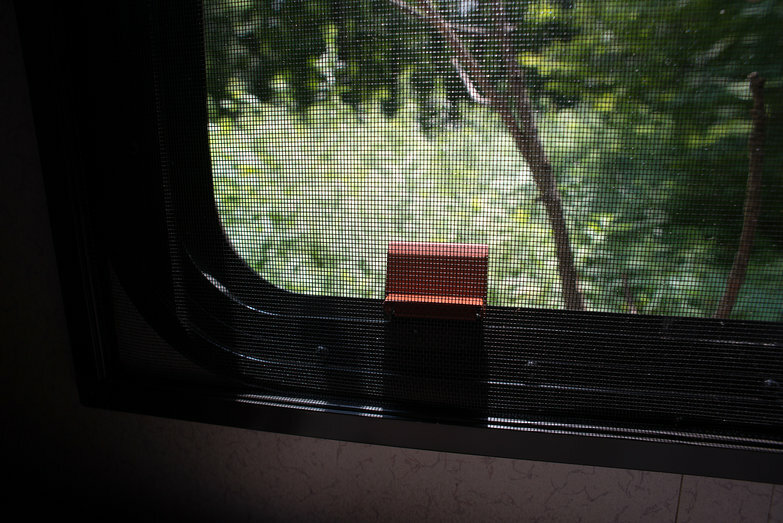 In the end, we decided to build a screen just larger than the window itself, then attach it to the wall of our camper using magnetic stripping. Rolls of sticky-back magnetic stripping? Check. Spline tool? Screw that, we'll just use a spatula. An hour later, we were back home, munching on a frozen pizza, discussing whether or not we had the wherewithal to attempt our screen assembly at 10PM. Motivated by an immense desire to open that goddamn window and have a BREEZE already, we decided to go for it. So, with our supplies and a cold beer in hand, we got to work making our first-ever screen. As usual, I did the measuring and Tyler did the cutting. In no time at all, we had assembled an empty metal rectangle, held together by four plastic corner pieces. Next, we attached the magnetic stripping around the window, and to the back of the frame. Finally, sitting cross legged on the floor together, we read the directions on the screen splining package and attached our screen using a heavy duty metal spatula. Success! 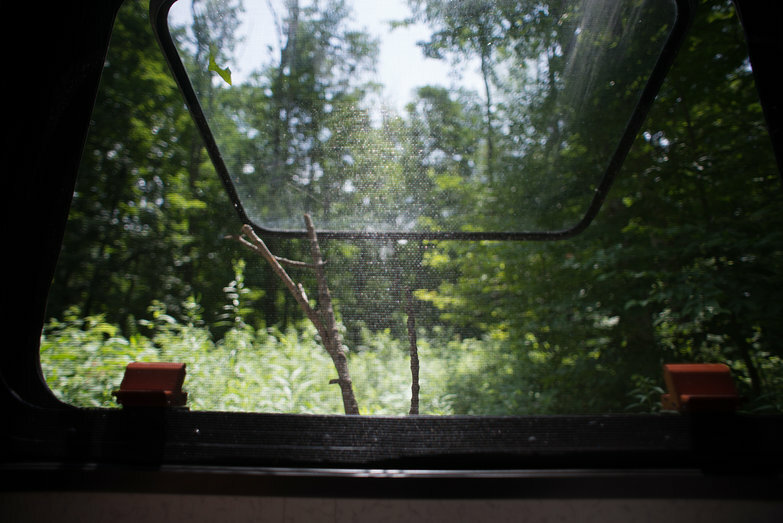 I could write an entire essay on the joys of opening that window, detailing how magnificent it was when thunder rumbled in the distance and cool air rushed through our new screen, allowing us to experience even more woodland life from our camper. It turns out a little discomfort goes a long way to making one appreciate the bliss of something as simple as a breeze. 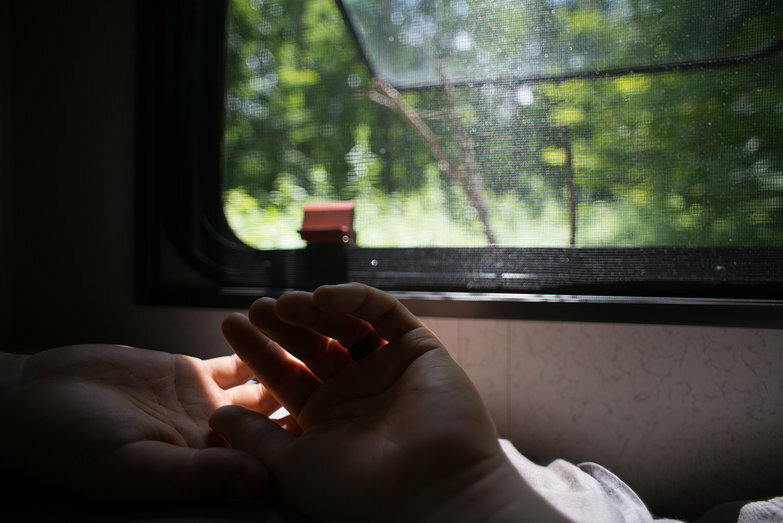 Instead of trying to describe it all in words, I think I'll just lay down and feel the zephyr caressing my body, and be grateful for a minor home improvement that has improved the quality of our lives dramatically. Yep, it sounds like you need a window screen. Ours wasn't hard to make-- I'm sure you can do it! This video should get you pointed in the right direction. If you do build a screen, let us know how it goes! Keep this in mind when measuring: installing the screen in the frame will cause the frame to be pulled inwards a little bit. Ours is a tad smaller than we thought it was going to be because the screen is so taut.